* Now displays automatic weather calculation based on iPhone/iPad localization features with available internet access. Just press the Fetch button. 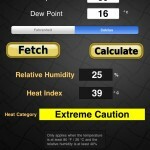 The Heat Index and Relative Humidity Calculator is a tool for measuring the perceived temperature and relative humidity. Because the body normally cools itself by perspiration, when relative humidity is high, the evaporation rate is reduced, and heat is removed from the body at a lower rate causing it to retain more heat than it would in dry air. The calculator will compute both the relative humidity and the heat indexThe calculator will compute both the relative humidity and the heat index when the values for the air temperature and dew point are entered. The results can also be emailed through the iphone’s email application. 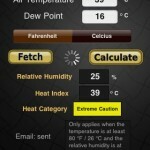 The application is completely compatible with the iPhone OS 3 and later, as well as the iPod Touch. 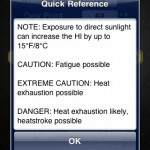 The heat category is a measurement taken from NOAA’s National Weather Service Heat Index Chart and is used to assist in determining how much caution should be exercised when outdoors for any period of time.